So the symbiote can be ranked to 5 and on the 18th a special event quest opens specifically for players to use the symbiote in? It seems pretty obvious that the symbiote isn't going to get to rank 5 unless a player finishes Master and/or epic and that if he doesn't make it to 5 he will not be of much benifit. So? What incentive do lower tier players have to even worry with raising him at all? With paths that eat up the bulk of 70 energy quills (which they don't have to begin with) at a difficulty level they are not equiped to win without dumping supplies and units into it until it hurts, where is the fun? What is the point? Why are we seeing the top getting gifted with more opportunities to collect neccessary items and the lower level is being dragged along to insult and injury? I think it's an extra difficulty where the symbiote will help. Its harder than Epic. Epic difficulty was nowhere near what it was last EQ either. Plus finish all 5 and get some awesome extra awards. The symbiote is not "for the symbiote difficulty." The symbiote is to assist players in whatever difficulty they struggle to complete. If you are a player who cannot complete master, gathering katalysts from other difficulties can get your symbiote to a place where he can help for master. If you cannot do epic, he can help in epic. Yeah... I feel like if you are struggling to 100% Master and get at least one run through of Epic, you shouldn't even bother with the next one. Having a supercharged symbiote can only get you so far. lower tier players. Why are we seeing the top getting gifted with more opportunities to collect neccessary items and the lower level is being dragged along to insult and injury? I really don't care that they opened up harder difficulties to everyone, but this is what some people are complaining about. If you are a "lower tier player" as you put it, you should not think you are capable of running through the higher difficulties. It's not aimed at lower tier players. And they aren't insulting you by opening up the higher tier difficulties to you (they are actually allowing you the chance to get rewards that previously weren't available to you). The symbiote really does make everything quite simple if you put in a little effort to read how his enhancements work. You pretty much didn't understand it at all. You get the symbioid. You complete the quests. You get the catalysts needed to rank up the symbioid. You take him to the next difficulty. You get more catalysts, and rank him up even further. All that and you can go in to the symbiote difficulty with him and others. Um they can enter it but can they finish it? Just seems like they are being set up to clean out their inventory. It takes them longer to complete content because they do not have max energy. Even if they play easy and normal and manage master they still will not have a maxed symbiote. They should have given the catalyists out in reverse. 10 for completing easy. Handicap the top for a change. It isbalways the lower tiers working with handicaps. Let them carry a level 2 symbiote with their six stars. Particularly given that you don't get to keep him they should have had the fun of being empowered for five minutes. Straight up! You clear out the entire inventory of the newbies they will walk innfrustration. Is there no level cap to enter Masters or Epic? The point isnt to give newbies access to epic. The point is to give players access to one difficulty higher than what they normally do. Normally uncollected? You can complete all of epic and have all the katalysts needed for the new difficulty. Normally only complete heroic? 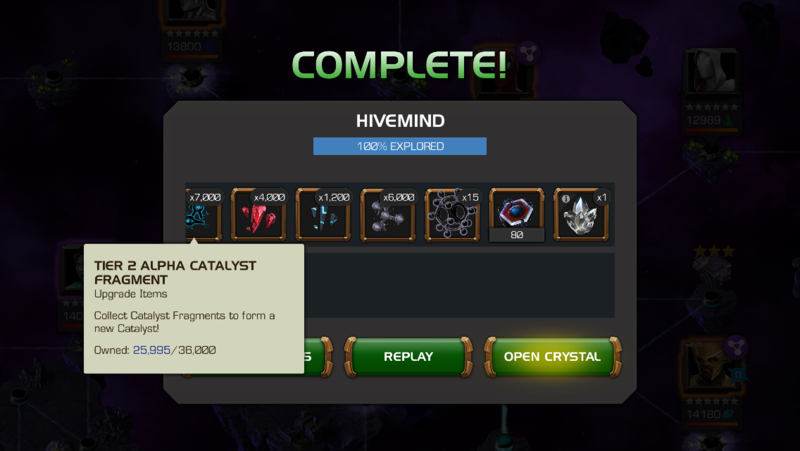 You can complete all of heroic and have all the katalysts needed for a reasonably strengthened symbiote to complete master. Now, the option there is to push further once you do the further difficulty. But then the timing issue comes in that you mention. No but if you give a scrub a r5 sl or blade he will still die to red hulk an others an not be able to finish 1 path . Even worth a r5 symbiote an the boosts you'll still need to have a certain level of skill to finish it. They've said it's very hard content. Nowhere did I say it would be easy. As long as it's possible to do a fight, anyone can do it. Of course skill is involved here, but that's obvious. The example I gave was one of a "impossible" fight, where you would only be able to hit the enemy once or twice before losing. "Of course they can" gives the impression even the worst player can finish it. No where do you mention skill is a given. i used my r5 symbiote with some enchancement on certain opponent or local nodes in Epic difficulty. For intermediate players in level60 with a few r4 5* wouldnt hurt too much. I know what youre trying to say here but use that symbiote with enchancement to help you out. He does the work easily for me compared to the previous EQ in Uncollected difficulty. If the idea is to face a greater difficulty then wouldn't carrying a rank one symbiote in the place of a ranked 5 or six make the quest more difficult for you? In fact with the points in the arena so rediculous anymore it is the guys with the top champs maxed out who should hit road blocks. Not the slub who couldn't keep up if hos life depended on it. But at least if the little guy didn't get hammered with the road block squad he could hit a few rank rewards even though with the entire mcoc roster at 3 and 4 they could never really contend in the first place...even grinding endlessly. If the point is more challenge wouldn't that pose some challenge? Point is...if the idea is to increase the difficulty there are a number of ways to do it without hammering.little guys or having to worry about them taking anything from you at the top. just to clarify, you're saying they should make the game harder for end game players, while giving the same reward to progressing players? You can think of it as like Lab of legends, content that you aren’t ready to take on yet but others are. Does LOL upset you? 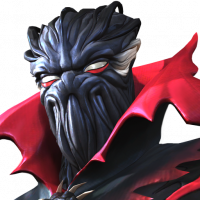 The point of this newer “harder” difficulty is to provide more content for people that either finish all difficulties and have nothing else to do for the last two weeks of the month OR a player that struggles to complete content but has a tool “summoner symbiote “ that he can rank up for 1 gold each level and use boosts to do all difficulties of this months EQ. What you could be justified in saying is you want more mid tier difficulty added in at the same time as this harder tier. Don’t worry about the stuff that’s too hard. It’s all bonus content. Remember it’s basically free to rank him up and if you can’t do the content to get the rewards needed to R5 him don’t worry, you weren’t meant to. Not the same. Don't have to go through special material to prep for lol or Collect special items for it. And i am not bothered really by any of it except the smell of another money grab. Everytime someone asks me what games i play, and i tell them mcoc, i get, "yeah, i know that game! I played it a couple of weeks/months and quit, takes too much time to get anywhere." Given statements like that seems like leading them into an item vacuum isn't really a great idea. I don't think you understand what a progressional game is. Not everyone is meant to finish all levels. Do what u can and get as far as u can. We all started with nothing at some point and worked our way up, so should u. In fact, its easier to get 4* and 5* heroes now than when this game first started so be happy.